The 6x86 in the photo wasn't already in the motherboard, I put it in since it was Socket 7. Elia1995 wrote: The 6x86 in the photo wasn't already in the motherboard, I put it in since it was Socket 7. Ah, okay. 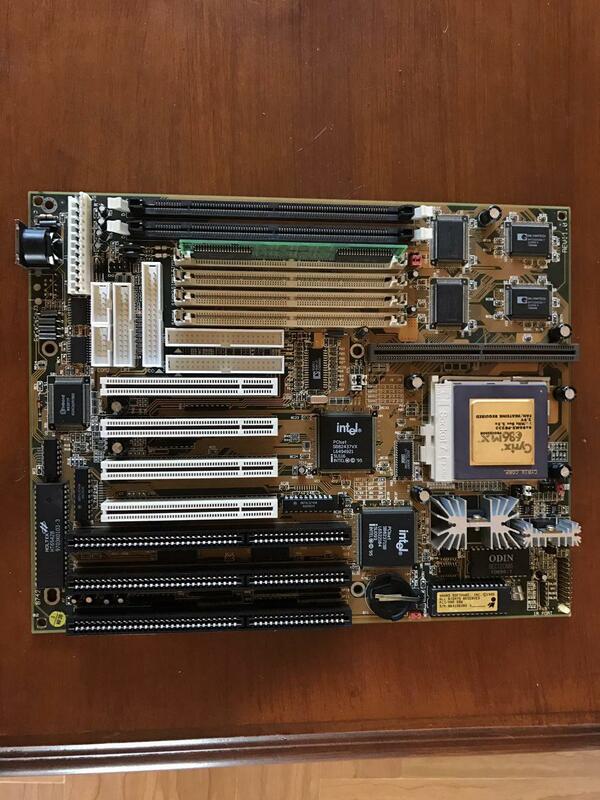 You might want to start with one of your Pentiums in that board, maybe that 120MHz? Then set all the jumpers in the right positions, these boards don't recognise CPU parameters automatically. It's really useful to find a manual for the board, we need to check if there are more jumpers to set. There might for example be a jumper to switch between single and dual voltage rails for the CPU, if dual is even supported). You need dual voltage for the Cyrix CPU, and having the jumpers/settings wrong might destroy the CPU! The problem is that I can't find the model of neither of those 2 Socket 7 AT boards written anywhere, not even behind them, there are no stickers and I can't find neither the brand nor the model. Elia1995 wrote: The problem is that I can't find the model of neither of those 2 Socket 7 AT boards written anywhere, not even behind them, there are no stickers and I can't find neither the brand nor the model. 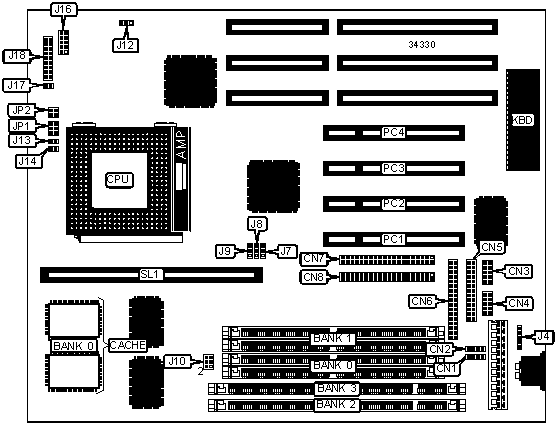 The board with the Cyrix in it has REV 1.0 in a corner. Often model numbers on boards such as that one are hidden a bit (sometimes they can be interwoven into a larger string). 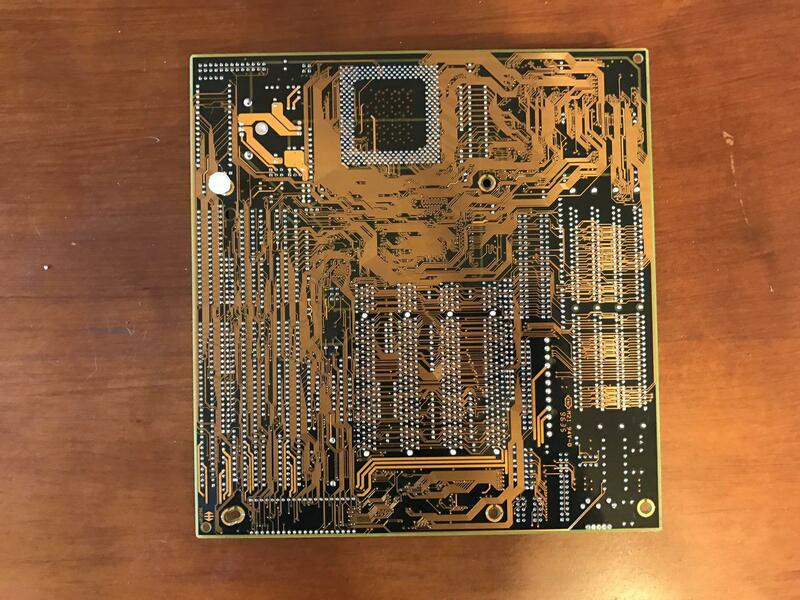 If you want, you could upload pics of the PCB (also the back with everything being able to read). The model number can also be on a sticker on the bottom ISA (or PCI) slot. Yes, if you could provide many pictures we can probably get you underway I'm also curious about your AT PSU, so if you could also make some more pictures of that? Ok guys, just took these photos, I show you every connector of that AT PSU and all the sides of it aswell. Googling the number of the first motherboard's sticker is useless. Power supply unit for this IBM is quite non-standard. The pinout is exactly like AT, but the unit has additional 3-pin connector. This connector is used as a power switch, making the power supply unit run when pins are shorted. I don't know what pins to short in the connector, be careful! EDIT #1: you should be able to remove the 'mushrooms' by using some small pliers to squeeze them on the component side of the board and pushing them down. Gently! It can be a bit fiddly to do, don't use too much force! Last edited by Cyrix200+ on 2017-8-10 @ 10:26, edited 3 times in total. Last edited by Cyrix200+ on 2017-8-10 @ 11:54, edited 1 time in total. The 2nd board shows 5DVX between the 1st and 2nd PCI slots, the other board seems to be tougher to ID. 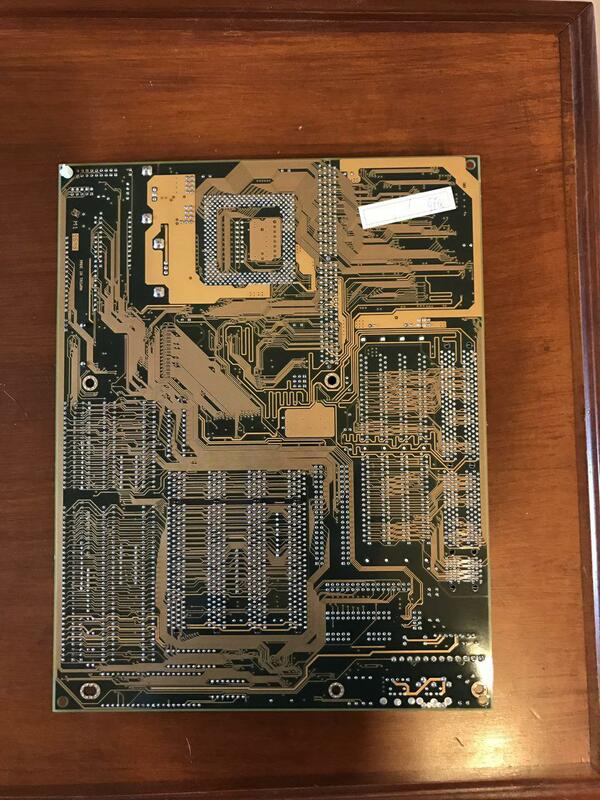 1st motherboard: What's that logo next to "M1"? It's on the back of the board. Also the fact it's made in Taiwan may help ID it. th99 has this board, looks a lot like your unknown board. Tetrium wrote: th99 has this board, looks a lot like your unknown board. Get yourself a normal AT PSU with power switch - if you want to play with pre-ATX stuff. Otherwise P1 requires 72-pin memory to be installed in pairs of the same capacity. On board #1 there is only one SIMM, so it won't POST. On the other one it seems they SIMMs are mixed - it might work. To test the boards use any Pentium 90/100/120. They usually work with any settings - unless it was configured for Pentium-MMX, then it won't boot. You'll have to configure the board correctly. kixs wrote: Get yourself a normal AT PSU with power switch - if you want to play with pre-ATX stuff. Otherwise P1 requires 72-pin memory to be installed in pairs of the same capacity. On board #1 there is only one SIMM, so it won't POST. On the other one it seems they SIMMs are mixed - it might work. I'd tend to agree with this here. Though if that PSU at least has the same pinouts otherwise (and if he can't find another AT PSU to use on short notice), wouldn't he be fine using that odd-AT PSU for at least basic testing purposes? In that case it doesn't matter if he has to find some other way to flip the power when using that odd PSU in any actual build? And that way he can at least continue testing without too much interruption. I didn't consider him not being able to boot these due to using only single SIMMs, because he mentioned the Cyrix chip wasn't in there when he tested and the fact that the Cyrix isn't even heatsinked (which would probably instantly fry or at least damage the CPU when trying to apply power). And he didn't manage to apply power to the boards due to it not having a regular power switch. 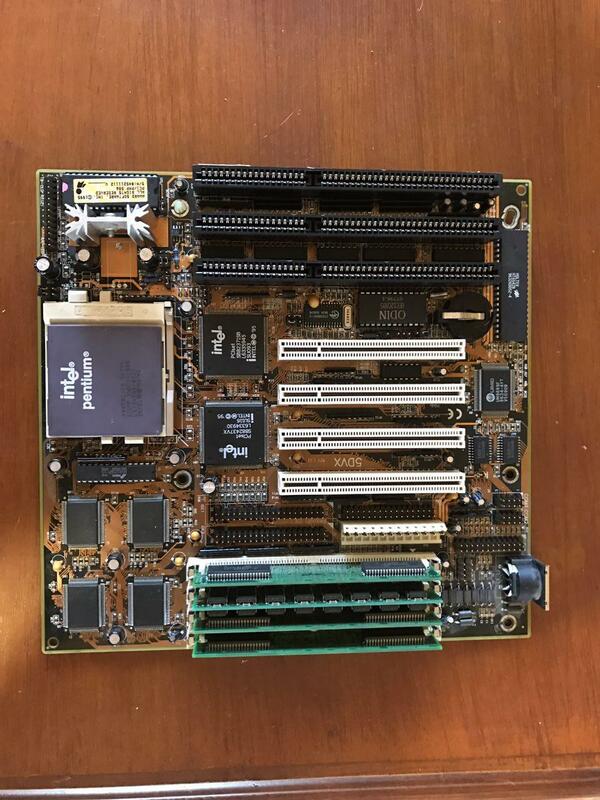 My personal favorite when testing boards like these are indeed such Pentiums, as these are very compatible and not much could go wrong (except maybe when accidentally doing a vast overclock (like 100MHz FSB + 3x multi, or something), but this should be preventable as the jumper settings are printed on the board most of the time anyway). What about the Pentium not having an heatsink ? Would it instantly fry as well or Pentiums can work like the 486 processors without anything on them ? I do have coolers anyway, so it won't be a problem, just want to make sure if that Pentium 120 would instantly fry like a barbecue. While on the Cyrix 6x86 it's written on the CPU itself that it requires an heatsink, so I would've put one on it anyway, but on the Pentium there are no warnings. Elia1995 wrote: What about the Pentium not having an heatsink ? Would it instantly fry as well or Pentiums can work like the 486 processors without anything on them ? The boxed Pentiums sold directly to end consumers came with a HSF mounted directly to the CPU, so these didn't need a HSF installation guide. Pentiums sold in trays were I think intended to be installed only by people who got an education in this field (like A+ certified people), it's why it may not have been printed on the chips themselves as these people knew about that already. It also may have been that it was common knowledge at that point in time. I'm unable to find any official manual on the Intel site atm. Maybe I'll find one later. It's unwise to go with only the info that you see when observing the parts themselves and do some additional research at the least. Especially in the beginning, I was doing reading and reading manuals and all kinds of sources of information a LOT. Later on I got the hang of things and things got to go more smoothly. But at the start, I basically googled everything , even serial numbers which got me nothing. I learned by doing (my homework) . The appliance is the same as post-ceramic CPUs, right ? Small droplet of thermal paste in the middle and then smash the HSF onto it ? Elia1995 wrote: The appliance is the same as post-ceramic CPUs, right ? Yes. It will help thermal conductivity a bit. I don't use it myself on these CPU's. Only on Pentium II and up. This is an AMD K5 chip. These chips are not that hot compared to newer chips (except maybe some Cyrix's and a few AMDs), so you can get away with more mistakes and such a Pentium could make due without any TIM (I'll typically use my cheapest stuff on there, if only because it does improve cooling efficiency and so it remains a habit).